During his trip to the Vatican on Oct. 17-18, South Korean President Moon Jae-In will deliver an invitation to Pope Francis from Kim Jong-Un to visit North Korea. In an Oct. 9 briefing, South Korean presidential spokesman Kim Eui-Kyeom said Kim Jong-Un’s invitation would be delivered to the Pope when Moon visits Vatican City as part of a nine-day European tour starting Oct. 13. 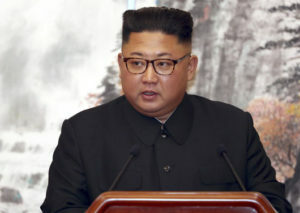 Kim Jong-Un promises a “fervent welcome” to Francis if he chooses to visit Pyongyang, the South Korean spokesman said. “President Moon suggested that Chairman Kim meet the Pope, pointing out that he is very much interested in peace on the Korean Peninsula,” the South Korean spokesman told reporters. It is yet to be confirmed whether the Pope will accept Kim’s invitation. The Pope, who visited South Korea in 2014, prayed for peace before the June 12 summit between Kim and U.S. President Donald Trump.